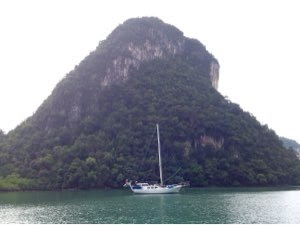 We're anchored in the Fjord in the south part of the islands around Langkawi yesterday before noon. The passage was 90% relaxing and 10% tense due to either traffics or hard winds. The Malacca Straits are just not fun. The yacht in the photo is SV Aurelia belonging to our friends Tina and Stevan from Australia.